Poured from a 8.4 oz mini bottle with unique striped foiling. Pours a murky brownish red with a small mildly pink head that quickly dissipates. Not the strongest lookign brew. Smell is amazing, pure strawberry with a little yogurt scent. Smells soooo delicious, not really like beer though. Taste is well of strawberries what else? A little bit of yogurtyness and some smokey malt flavor. Not too bad. Mouthfeel is silky smooth, this is a delectable dessert beer. Overall, yes it is a fruity beer, but still worthy. A- Pours a light pink that's topped by a 1 1/2 finger white head that quickly dissipates. Beautiful colour! S- Sweet strawberry jam with a nice tart finish. Not able to seek out the coriander mentioned in the brewers description. T- Same as the aroma. Beautiful taste that could take the place of a quality desert anytime. M- Light Body and Medium carbonation. O- If there ever was a perfect desert beer, I would have to say that this is it. Delicious Strawberry Jam flavour and aroma and a light, crisp, refreshing body. A: Poured from a bottle to a pint glass. Had an amber color and a cloudy consistency. There was a small amount of foamy head that quickly dissipated. OK lacing. S: A very strong, potent smell of strawberries. Couldn't detect much of anything else, but it was pleasant. T: Tasted of strawberries, strawberries, and more strawberries. There's a slight (very slight) maltiness, but this is overwhelmed by the tart, vibrancy of the fruit. S: A highly carbonated beer with a surprisingly dry and smooth finish. Light-bodied. D: I guess your attitude toward this beer depends on how much you like strawberries. I found it to be drinkable. 8oz bottle poured into a wine glass for a quick fix. Fruli looks nice coming out the glass, A red mixed with pink highlights and a substainable red colored head, how nice. The crown gains an inch and sticks leaving cluttered lace. First whiffs I get a lot of strawberry which is not all that real. It reminds me of tropical fruit starbursts. I happen to like those so I'll give this a pass although it's artifical. Fruit juice with a faint sweet malt. This ain't all that bad, there's a time and place for everything. Not the most artificial fruit flavor I've had in a beer, it's quite quenching. Small hints of vanilla and strawberry's combined. A big malt backing. Starbursts meltesd in the summer. The feel is smooth and sweet, no interference from any hops. Medium bodied and a lot of carb giving off a lash to the tounge. This is brewed by Huyghe so there is some quality to this, although it's nowhere near the best fruit offering. 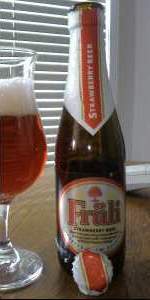 The Fruli is an extremely saccharine fruit beer. When paired with a drier mouthfeel and a hot, stuffy room, it gives me a headache. Disturbingly sweet, disturbingly pink, disturbingly carbonated. I am not a fan. I can see the appeal for fans of soda pop. It is easy to drink several Frulis without noticing the alcohol content (though there is certainly a taste of alcohol in the beverage). Far more on the side of a cooler, based on the astronomical sugar content of this beer. Another one of those witbiers blended with fruit that seem to be popping up everywhere. The label says it is made "with natural and artificial flavors added." An immediate turn off. Keep your artificial flavors out of my beer! A-Pours the color of Hawaiian punch with a thin pink head. S-Like sweet, fake strawberry juice. No hint of wheat beer in here. T-Pretty awful. Tastes exactly like what you'd get if you mixed one of those mass produced, from concentrate fruit juices with a low quality,adjunct riddled macro wit like Blue Moon. It's not often that I get pissed off while drinking a beer. M-Thin and syrupy, with very little carbonation. D-This beer is a joke. Avoid like the plague. I found this to be an unexpectedly characterful and satisfying beer. Deep pink, faintly brownish hint, it had a medium white head with faint pink hue slowly shrinking to foamy top. Aroma is bright strawberry fruit leather, hint of yeasty dough. Taste is light, bright strawberry sweetness, light yeastiness, hint of coriander, spice. It is crisp, light, and refreshing, but nevertheless characterful. A- Pours a very pink color. Points added for a decent head with good retention on it. Most fruit beers screw that up. S- Smell is of strawberries, sweet, with just a hint of coriander and orange, as advertised. They promised strawberries and delivered. There is just a little beat of yeasty twang as well. But largely strawberrry. T- The taste is more sour whereas the nose suggested sweet. Coriander, orange, and wheat are vaguely present. As it warmed the yeastyness became more apparent to me. M- Light with low carbonation, which is good, as overcarbed fruit beers tend to seem like soda. D- It's not bad, for a fruit beer, but in the end, it's still something of a novelty beer and not something i seek to sessionize. Review from notes on May 22, 2009. Poured from an undated 8.4 oz cute little bottle. A - Slightly hazy, reddish orange with an off-white and rose-tinted 2" head in a tulip. Yielded some lacing. Pretty cool color. S - Tart berries with a hint of strawberries. Slightly bitter aroma as well, perhaps of orange peels? Somewhat funky, reminiscent of a saison with strawberry syrup. T - Very sweet, like a strawberry orange soda. Some coriander maybe? Not much else though. A touch of bitterness in the finish reminds me that this is still a beer and not a soda. M - Refreshing and light bodied with high carbonation. Sticky and syrupy finish. D - Quite drinkable, although if I want a beer, I would rather have something less sweet and soda-like. This is why I must detract 0.5 from the score. Overall - Swirled and added the residual yeast into the glass when there were about 3 oz left. The yeast added a bit more fullness to the body, a bit of texture, and takes some of the cloying sweetness away. I paid about $3 for this and I'm going to go ahead and say that it's worth the novelty factor but I probably won't be getting this again. All in all, not a horrible beer though, just quite different from what I'm used to in terms of fruit beer. 330 ml bottle with a BB March 2017 date stamp. Looks like watered down strawberry puree with a thin, partial white head. Actually, not bad looking despite that description. Nice mix of tart and sweet components with plenty of strawberry and strawberry jam flavor. O: refreshing, fruity and not to sweet but best used as a dessert beverage. I reviewed this beer tonight while listening to Panda Bear's album "Person Pitch." There is no freshness date on the bottle. I poured it into my Ommegang chalice, after letting it warm up just slightly from the fridge temperature. A: A blossoming three fingers of light pink head rose up quickly. The body of this beer is a murky rose pink, with peach highlights. It seems almost brownish. The head retention is good. However, despite the quality head on top, this beer looks dull and murky. Also, be on the look out for the sludge at the bottom of the glass. It isn't pretty, and it doesn't taste good. S: The smell is a force to be reckoned with. The scent of strawberries practically billows out of the glass. The sweet scent of ripened strawberries overpowers any other aroma. In my opinion, even though it smells like genuine fruit, it is just a bit overdone. T: Up front, it tastes very much like strawberry juice. It is almost puree-like. The tip of the tongue picks up a lot of sweetness; then, as the liquid migrates towards the back of the mouth, a welcome tartness causes the tongue to salivate. It is a welcome balance to that almost cloying sweetness. It is surprisingly dry at the swallow, exhibiting the refreshing characteristic of witbier. The aftertaste is mostly strawberry with (finally) some back-up from the Belgian spices. A soft orange peel...grains of paradise maybe? I think the flavor is very well crafted, remaining balanced for a fruit beer. Good idea combining fruit beer with Belgian white. M: The carbonation is light and spritzy, lifting the beer right off the tongue. It's medium body is full of residual sugars. Some could think this beer to be overly sweet. There is a lot of sugar left behind in the mouth after the swallow. Yet, the carbonation is just right, making this beer much, much more palatable. D: I don't think I would ever want to consume more than one of these 11 oz. bottles in a night, or even in a week. It should rate higher, since it is a fruit beer and has low alcohol. This should be a tasty summer treat, yet I find it too heavy for that role. It is a good beer, and an excellent concept, but it falls short here. Pours red-ish brown-ish colour with light pink head. As normal fruit beer this one smells like fruits - strawberries in this case. Taste is the same - strawberries, very sweet, nothing but strawberries. Very carbonated, sparkly and crisp. I quess it's drinkable if you like strawberries. It's pretty good beer, but I think strawberry flavor is a bit overhelming. Poured ontap, a hazy dull red in appearance with some pink colored foam. The beer smells quite fruity, strawberries fill the nostrils. Taste is more akin to a strawberry soda than a true beer. Dull lambic qualities and over the top fruit and sweetness dominate the palate. It succeeds fairly well with the strawberry taste, the only downfall being the lack of beer qualities. Malt body is faint. If strawberry soda is a favorite of yours, you must try this beer. Mouthfeel is medium bodied with a lingering sweetness. Drinkability: A sweet strawberry beer sure to please the ladies and non-beer drinking friends. Minimal off-white head; also minimal lace. Smells of a strawberry cola. Effervescent, refreshing strawberry cola taste. Hard to believe there's any alcohol in this. A delight.